Dortmund - If, as he has intimated, Ilkay Gündogan makes an appearance against 1. FC Köln on Saturday, it will have been 427 days since the Borussia Dortmund midfielder last tasted professional action for either club or country. On 14 August 2013, four days after starring for BVB in a 4-0 win at FC Augsburg on the Bundesliga season’s opening day, Gündogan was picked to start for Germany in a friendly against Paraguay in Kaiserslautern. He scored after 18 minutes but lasted just 27 before being replaced, with Germany drawing the game 3-3. 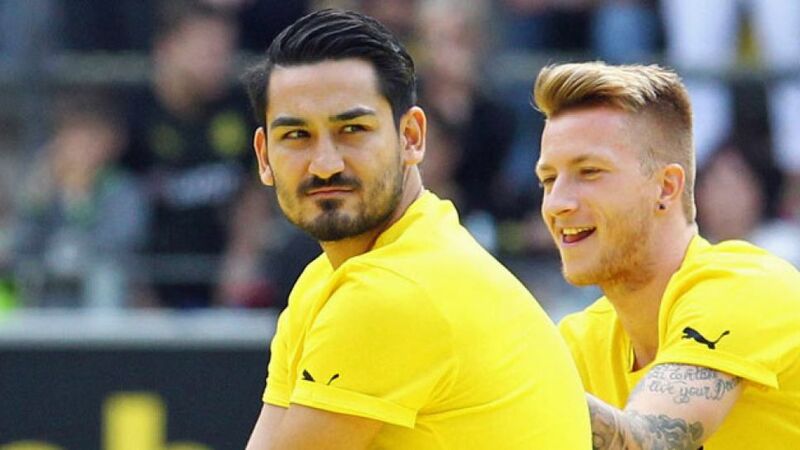 Gündogan has not played a first-team game since. Back injuries are not to be taken lightly, and there was no assumption on either the part of the national team, the club or the player himself that he would be fighting fit again after a few sessions in the massage room. Yet few could have guessed - and even fewer would have feared - that it would be over a year later before the man described by Joachim Löw as having the “potential to be world class” had a realistic chance of playing professionally again. Instead of a timely return to the Dortmund fold, what has followed has been months of treatment, diagnoses and consultations - and setbacks. For a player that had made such huge strides in the preceding months and dreamed of representing his country at the 2014 FIFA World Cup, it was a shattering blow. After missing out on the 23-man squad for UEFA Euro 2012, Gündogan set about establishing himself as the Bundesliga’s best central midfielder the following season. Dortmund finished the domestic campaign 25 points behind champions FC Bayern München, but they stunned the football world by reaching the UEFA Champions League final, twice beating Real Madrid CF along the way and producing throughout the competition a brand of football that won German football and Dortmund a legion of new fans. Gündogan was at the heart of their pacey, dynamic and innovative style, and though die Schwarz-Gelben were defeated in the final - again by Bayern - the entertainment they provided made them seem like winners. Gündogan, quietly brilliant in the group stages and earlier knockout rounds, saved the final at London’s Wembley stadium to announce himself on the world stage, scoring BVB’s equaliser from the penalty spot and finishing the game as perhaps Dortmund’s unluckiest loser. Questions about whether or not he possessed the temperament for the big stage had long since been quashed by another defining performance a few months earlier. In February 2013, Germany travelled to Paris for a friendly game with France and won 2-1 thanks to goals from Sami Khedira and Thomas Müller. Yet the standout player was Gündogan. He delivered a masterful performance next to Khedira in the middle of the park, combining his Dortmund-induced love of pressing with a natural ability to retain possession, the hallmark of any accomplished international player. “His assuredness in possession and calmness under pressure was remarkable,” said Löw afterwards, with some observers tipping him to push Bastian Schweinsteiger out of the national team permanently, should he maintain his form. That was never the problem for the one-time FC Schalke 04 trainee, however. He was at the top of his game in the closing weeks of the 2012/13 season, progressing into a “top-class international player” according to Löw, before being floored by the chronic back problem with which he has been waylaid. A year is an awfully long time in football and much has happened in his absence. Robert Lewandowski has left Dortmund with a whole host of players coming in, and the team have reached - and lost - another final against Bayern. Then there’s the small matter of Germany winning the FIFA World Cup for a fourth time, with a rival 23-year-old in Christoph Kramer staking his claim to be Schweinsteiger’s potential heir. For so talented a player to have been deprived of action for so long undoubtedly leaves a sour taste, but that enduring disappointment should evaporate rather quickly when and if Gündogan is able to he breathe the Bundesliga air again this weekend. Making up for lost time will seldom have felt so good.